A site by an airport is special: any building there will make its mark not simply on those passing on the ground but on those who fly over it. A figural building that stands out from the orthogonal grid can make a strong statement about its importance and add an element of architectural interest and relief to the repetitive geometry of the traditional network. If anywhere, the territory of an airport – home of flight, one of our most thrilling technologies – is the place to create a building of remarkable and memorable character. This shaped torus form is nothing less than a landed UFO and has the potential to become one of the most memorable buildings in China. Reflecting the program, the building is divided into three components. The first element of the project include all parking and a “double” building – reflecting the presence of both public agencies and private tenants – within the torus shape. This main building embraces, as well, a large, secluded, courtyard space for solar access, socializing, lunching, and a quick cigarette. 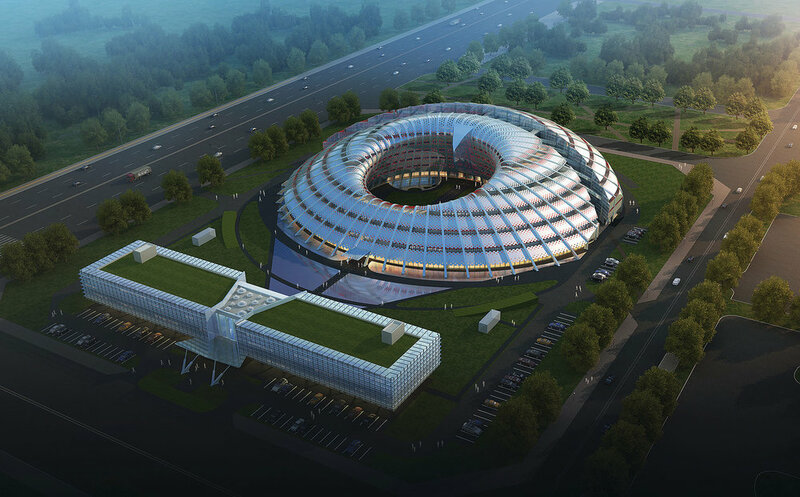 A second, smaller, building with a simple rectangular shape to contrast with the dramatic disc of the main building is spatially and functionally independent of the larger torus-building but – per the client’s request – with a commanding view of it and a gateway to it. All of the components of the project are linked by a memorable sequence of public spaces, beginning with a dramatic entry, which ascends to a graceful, glazed stair to link the torus vertically. The main circulation axis crosses the narrow passage that defines a gap between the two halves of the torus and which provides east-west circulation across the site, passes out and across the circular courtyard, runs through the building again, crosses the densely landscaped site and finally flows through the ancillary building on the site’s southern edge. Credits: J. Gu, M. Inmaculada Bueno Rosas, M. Okazaki, M. Sorkin. Xi'an Architectural Design-research Institutes: Q. Du, Z. Li, Y. Sun.